This initiative describes how to strategically plant trees to reduce the effects of what is known as the urban heat island effect. The urban heat island effect is the result of lost natural environment, which has historically helped reflect infrared rays (IR) and naturally cool the microclimate. Simply put, trees and vegetation naturally reduce surrounding temperatures while pavement and the built environment absorb heat, increasing surrounding temperatures. By knowing where to plant trees, what kind of trees to plant, and how to maintain the trees the neighborhood and its residents could greatly reduce energy costs. Trees and vegetation can easily be overlooked when improving energy efficiency and reducing energy costs. Trees reduce summer temperatures in two ways, by shading direct sunlight and by evaporating water through their leaves. Studies have shown that trees can reduce daytime summer temperatures by about 10ºF (McPherson and Sampson, 1995). Other researchers have found temperature decreases of more than 20ºF (Gomez, et al. 2004). Deciduous trees drop their leaves in the winter months, and when properly placed can block unwanted direct sunlight in the summer while allowing the warmth of the sun to pass in the winter. Alternatively coniferous trees keep their leaves in the winter months and should be planted on the northern side of buildings to block winter winds, while not blocking winter sunlight. The U.S. Department of Energy explains that “landscaping may be your best long-term investment for reducing heating and cooling costs” and that three properly placed trees could save you $100 to $250 a year (1995). According to the USDA Forest Service properly placed trees can reduce air conditioning needs by 30% and save 20% to 50% in heating costs while also adding an average of 10% to your home’s value. The region you live in determines the most effective way to landscape with energy conservation. The United States can be divided into four approximate climate regions: temperate, hot-arid, hot-humid, and cool (USDA, 1995). Muncie and the rest of Indiana is located in the temperate climate and should: maximize warming effects of the sun in the winter, maximize shade during the summer, deflect winter winds away from buildings, and funnel summer breezes towards home. Solar heat passing through windows and being absorbed through the roof is the major reason for air-conditioner use. Shading is the most cost-effective way to reduce solar heat gain and cut air conditioning costs. Using shade effectively requires you to know the size, shape, and location of the moving shadow that your shading device casts. Trees can be selected with appropriate sizes, densities, and shapes for almost any shading application. 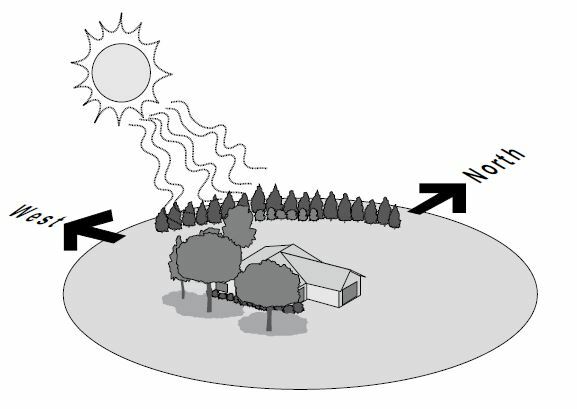 To block solar heat in the summer but let much of it in during the winter, use deciduous trees. To provide continuous shade or to block heavy winds, use evergreen trees or shrubs. Deciduous trees with high, spreading crowns (i.e., leaves and branches) can be planted to the south of your home to provide maximum summertime roof shading. Trees with crowns lower to the ground are more appropriate to the west, where shade is needed from lower afternoon sun angles. Trees should not be planted on the southern sides of solar-heated homes because the branches of these deciduous trees will block some winter sun. A 6-foot to 8-foot deciduous tree planted near your home will begin shading windows the first year. Depending on the species and the home, the tree will shade the roof in 5 to 10 years. If you have an air conditioner, be aware that shading the unit can increase its efficiency by as much as 10%. Trees, shrubs, and groundcover plants can also shade the ground and pavement around the home. This reduces heat radiation and cools the air before it reaches your home’s walls and windows. Use a large bush or row of shrubs to shade a patio or driveway. Plant a hedge to shade a sidewalk. Build a trellis for climbing vines to shade a patio area. Evergreen trees and shrubs planted to the north and northwest of the home are the most common type of windbreak. Trees, bushes, and shrubs are often planted together to block or impede wind from ground level to the treetops. Or, evergreen trees combined with a wall or fence can deflect or lift the wind over the home. Be careful not to plant evergreens too close to your home’s south side if you are counting on warmth from the winter sun. A windbreak will reduce wind speed for a distance of as much as 30 times the windbreak’s height. But for maximum protection, plant your windbreak at a distance from your home of two to five times the mature height of the trees. Plant low shrubs on the windward side of your windbreak to trap snow drifts before it blows next to your home. In addition to more distant windbreaks, planting shrubs, bushes, and vines next to your house creates dead air spaces that insulate your home in both winter and summer. Plant so there will be at least 1 foot of space between full-grown plants and your home’s wall. Summer winds, especially at night, can have a cooling effect if used for home ventilation. The neighborhood association should inform residents about the multiple benefits of trees, as discussed in this initiative. They could then collectively determine if and where street trees should be placed in the Right-of-Way. Once this is determined the process of getting the trees is simple. By contacting the Muncie Urban Forester, Kellie McClellan, street trees can be acquired for in the right-of-way. Additionally if the neighborhood association noticed that a large group of residents wished to acquire personal trees for private property they should then attempt to compile a list of residents who would like to receive free native trees and file for grants with the National Wildlife Federations’ Trees for Wildlife. Interested residents should first assess their site. This includes looking above for power lines over your head? If you do, the tree you plant should be a low-growing tree, or less than 25 feet at full maturity. If you want to plant a tall tree, look for another site without power lines overhead. Either a medium tree of 25 to 40 feet at maturity or a tall tree greater than 40 feet. Look around do you see a road, sidewalk, or curb nearby? Tree roots can grow outward underground beyond the distance of their crowns. Trees need enough soil to grow and survive for a long time. Roads or sidewalks can keep water and nutrients from getting down to the roots and limit the amount of available soil. Tree roots may lift a sidewalk over time if the area is too small. If you know your tree will grow to be tall and will have an extensive rooting system, be sure your planting area is large enough. Is there a house or other permanent structure nearby? The shade from deciduous trees planted on the east or west sides of a house can help to keep it cooler and conserve energy in the summer. Because deciduous trees lose their leaves, they will let in the sun to warm your home in the winter. Conifers can provide a wind screen in the winter. It is important not only to pick the right kind of tree, but also to plant it the right distance from the house. Are other trees nearby? There are several reasons not to plant trees too close to each other. Some trees need lots of light from the sun to grow while shorter forest understory trees need less. If a tree that requires full sun is planted in the shade of a larger tree, it will not grow as well. Is a water source, like a faucet, nearby to water the young tree? Trees need water to grow, especially for the first two years after planting. The easier it is to bring water to the site, the more likely you are to give it a sufficient amount of water. Look down. Might there be pipes or wires underground? It can be dangerous to dig a hole if there are buried electric wires, cable wires, telephone wires, water pipes, natural gas lines, or septic tanks. Before you do any digging in the U.S., call 811 or go to http://www.811.com to have utilities marked for free. Typically, the soil depth needed to plant trees by hand does not impact utilities, but this step is recommended in any urban or developed settings. How fast does water drain from the soil? Different types of trees need different types of soils. If water does not drain from the soil quickly, air cannot move in and through the soil because small places are filled with water. The roots of some trees need less air and can live in soil that drains slowly, like those trees native to wetland areas. The roots of other kinds of trees can live in soil that drains water very fast and may be drought-tolerant. To know the right kind of tree to choose, you should know what kind of soil you have. Conduct a soil experiment. To test your tree planting site, dig a hole about 18 inches deep and 12 inches wide. Fill the hole with water. Now carefully time the water draining from the hole. If the water drains away within an hour, the soil has good drainage. If it takes a few hours to a whole day to drain, the soil has slow or “fair” drainage. If the water takes more than a day to drain, the soil has poor drainage. Your local Cooperative Extension service (listed in the yellow pages or search for your county directory) an assist with telling you what type of soil is present. Once you have identified three locations, complete a chart with the Street Address (including name of site), owner of site (if known, or continue with next step), pros of planting at this location and cons of planting at this location. Trees should be planted either in the spring or fall to ensure the tree will have a good chance to grow strong for many years. Select two days (about 1 week apart) when you can plant trees. You will need to provide these dates when you order your trees at http://www.nwf.org/trees. Trees are send to you a few days prior to your planting date and will not be sent if it not the right time to plant trees for your area. The neighborhood association should partner with local organizations to organize an annual earth day where native trees can be given away. This event should aim at educating residents the importance of planting trees and how doing so can reduce energy costs and increase home value. The neighborhood association should develop partnerships with local organizations including City of Muncie Urban Forestry Department, the Community Enhancement Projects, and Ball Brothers Foundation. To accomplish this goal the neighborhood association should partner with Vectren to locate initial funding options to provide money which could then be used to apply for matching grants with the Indiana Department of Natural Resources Division of Forestry, and the National Wildlife Federation. The map below identifies locations where trees could be planted throughout the study area. The green identifies where large trees could be planted, the yellow identifies where medium trees could be planted, and the orange identifies where small trees could be planted. The National Wildlife Federation (NWF) describes small trees as 25 feet or less, medium trees as 25 to 40 feet, and large trees as greater than 40 feet. The NWF explains that small trees should be located 10 feet from a building wall and have 9 square feet of planting area, medium trees should be located 15 feet from building walls and have 16 square feet of growing area, and that large tree should be located 20 feet from building walls and have greater than 16 square feet of growing area. These dimensions are to ensure that the roots do no weaken building foundations or other infrastructure such as sidewalks, roads, curbs, parking lots, and etc. The map combined this information with existing tree coverage to identify suitable locations. Figure 3 – Suitable locations for large (green), medium (yellow), and small (orange) trees. Map: Derek Walker. For the second consecutive year, the Town of Huntington, New York will partner with the National Wildlife Federation to give away 250 native trees in an effort to restore and better manage its tree canopy. The Town will give one native bare-root tree sapling to the first 250 residents, courtesy of the National Wildlife Federation. Residents who receive a tree will be asked to plant it on their property. The tree saplings will include red oak, white oak and sugar maple. Planting instructions will be included with each tree. The goal of the tree giveaway is not only to better inform residents about proper tree planting and tree benefits, but also to create an interactive map that shows each tree’s location, the species of tree, and physical characteristics of the tree and a timeline of photos that shows the growth of each tree. The town and its residents lost thousands of trees in October of 2012 when Superstorm Sandy devastated the area. At this year’s tree giveaway event – scheduled for April 24th – participating residents will receive the trees, plant the trees on their properties and provide ongoing documentation on the trees’ growth and development. The Town of Huntington prides itself on its “Tree City USA” designation and strives to continue developing its native tree canopy. 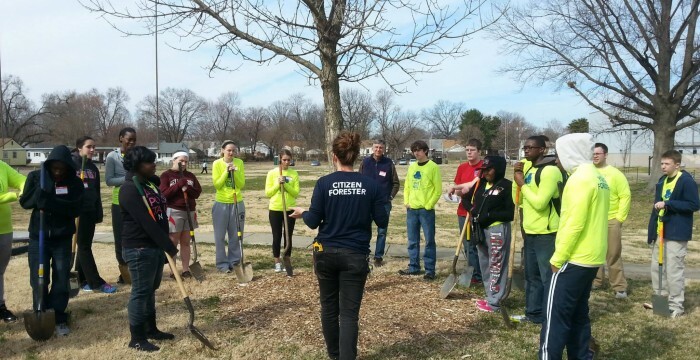 Love Louisville Trees (LLT) provides urban forestry training to build community capacity in urban forest management and stewardship and organizes tree-planting events to assist with the reforestation of Louisville’s neighborhoods. 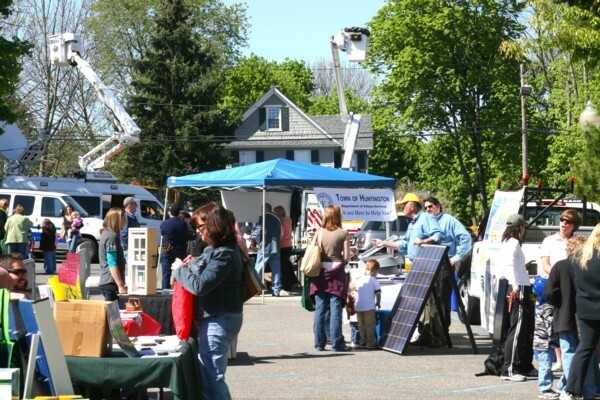 LLT works to educate the public on the benefits of an urban forest, helps to guide neighborhood coordinators in the development of annual tree planting and maintenance events, and provides trees to financially challenged areas in our community. Through encouragement and community engagement, citizens are trained in proper tree selection, planting and on-going maintenance. We understand that for an urban forestry program to be effective we must engage and recruit students, residents, business owners, and all members of our community to take ownership of our urban forest. The LLT Program was created in response to recent research demonstrating that not only does Louisville have one of the fastest rising heat indices in the USA, but also has a significantly lower level of tree coverage compared to similar cities. Recent tree mortality from invasive pests, storm damage, lack of citizen forestry skills and the absence of a developed city plan has contributed to higher pollution levels, poor storm water management, and barren urban landscapes. We organize tree planting events in neighborhoods near the urban core, where large trees can have the biggest impact as they cool streets by providing shade, purify our air, beautify our streets, and absorb and purify storm water. 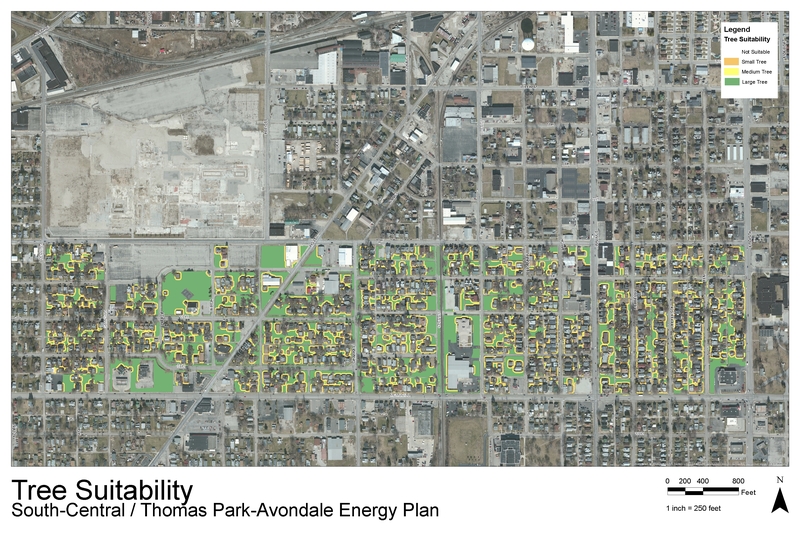 We also know that trees planted on residential properties can reduce utility bills and raise the value of property, particularly important in low-income neighborhoods where canopy development has often been neglected. Link to application page, National Wildlife Federation. Describes requirements to receive free native trees. Gomez, F., J. Jabaloyes, and E. Vaño, 2004. Green zones in the future or urban planning. Journal of Urban Planning and Development. (June): 94-100. McPherson, G. and J.R. Simpson, 1995. Shade trees as a demand-side resource. Home Energy Magazine. 12(2) (March/April). Available online athttp://homeenergy.org/archive/hem.dis.anl.gov/eehem/95/950307.html.